4 weeks. More irony. The recurring theme to all this. More insights, some truths were finally disclosed. Discussions, analyses. Too much, too hard, too theoretical? Maybe we spent more time thinking than living. Sure, there needs to be some fundamental thoughts around the situation. But sometimes the thinking takes the place of the actual practical experience. We live through the paper and through books. We don't live. Just live. And that was the conclusion I came to. Suddenly the thinker has had enough of thinking for a while. Too much analyses in too many areas of my life. No solutions, and more thinking does not always make things clearer. A deep breath, a step back, empty your mind. Perhaps that might be better. Too much information clouds one's mind. With an emptiness, maybe one can see better. It's just like being away from Sydney made me see that I would like to stay here longer, that I was not done with it yet. Being in Sydney, made me long to leave Sydney, can't wait for the stint to end. Now the stint is too short, more thinking on how to extend it. No solution yet. So now the thinking is held in abeyance for a while, in the meantime, people live. Go with the flow for once, or twice. We make our mistakes, we live through them, we learn from our experiences, we become stronger people. But in the meantime, we live life the way it is supposed to be - savoured and experienced and not just strategising on paper, our next move and the next 5 after that. In the meantime, I'm going to live a little. I have always known that if you do not wear a pair of shoes (and we are talking dainty shoes not sneakers but perhaps the rule also applies to sneakers but I'm not so sure) for a prolonged period of time, the shoes go into this state where they appear to look pristine, but in actual fact, their internal structure has weakened to the stage of near-disintegration - except they still look whole and intact. Anyway, this knowledge which has been stored in the recesses of my memory from whatever past, was recently brought to the forefront of my mind when I packed this pair of pretty powder blue sling-backs with me from Singapore. Finally it's warm enough in Sydney to wear pretty open-toed shoes I thought. Well, the first night I wore them, when I got to the meeting place, I noticed the side of one was sort of coming out. I prayed that this was only a minor problem and quickly pushed the thought of going home to change to another pair of safer shoes, aside. They held up the whole night even through the 15-minute walk to the crowded and hip sushi bar we ended up at, where sushi was served in little, bite-sized pieces such that you end up eating seemingly a lot more than your usual. It was on the walk back that the shoes caved in. Well, the right one which had the side coming apart, just split right in the middle and it parted like the Red Sea showing my foot with all the recent blisters from the hikes to and from work, in its full glory. Back to Sydney. Almost home. A strange sensation. Almost familiar. The first thing that greeted me was the heat. Hot , hot, hot but surely not as hot as Singapore, far from it, but it sure feels hotter, just less muggy. I walk into the welcoming heat, with the low(er) humidity, this was actually much better than Singapore. At least there is a breeze. The next thing that greeted me was a welcome back sms from someone whom (ironically) I've said goodbye to some 3 weeks ago before I left on my trip. Not completely unexpected but still not on familiar ground. Today was a back-breaking day. I had spent the last 2 weeks packing up my apartment, a couple of hours each time, on and off. The piles of personal effects had grown to ginormous proportions. Huge bags (capacity to take a full human body without the need to chop it up to fit - just as a comparison), warehouse storage boxes and a ton of plastic and paper bags had filled the floors and cupboards. I had ruthlessly (or so I thought) culled the pile by throwing out files, personal papers, old love letters, magazines, bags, clothes and various odds and ends. But still, it was literally packing up a whole apartment and my old life and the number of photo albums and paper envelopes containing film and negatives were surprising. I guess I had documented my life in pictures, after all, a picture says a thousand words, and now they will be relegated to storage, I am not sure how often I would be looking at them after this, but at this point in time, I don't feel like it's time to just discard them all yet. As it is, I had just destroyed letters which were 18 years old, perhaps it wouldn't take me quite this long to get rid of the photos. We spent an hour loading up 3 cars, with plenty of strategising as to which car can take what, and how we were going to load up the cars so as to have the best fit. It was just as well S and I didn't go to to the gym earlier as planned, we had plenty of exercise with the move, and were all hot, sweaty and tired by the end of it. Unloading was much easier, we had employed the assembly line/division of labour system. Everyone moved with military precision, the quick, rhythmic movements were like clockwork, we didn't even have to really think about anything. 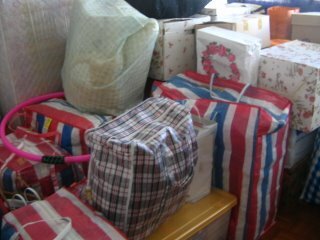 Everything was quickly loaded into mum's spare room. After everything was piled in there neatly, they didn't even look as much as before. It also helped that there was a humungous, empty TV carton that I had stuffed all the loose plastic and paper bags into so that everything looked pretty organised. Almost 2 weeks have zipped by. I have eaten my way through the local food to add 2 kg to my weight, and the belt had to be loosened an inch. I am partially wracked with guilt, but on the other hand, tell myself when I get back, and don't have the luxury of these much-missed food, I will lose the weight I have (and will) gain in the 3 weeks back home. I have so many things to sample, so many friends to meet. Never realised how many friends I have until I got back, and not just regular friends, but good friends whom I want to meet and whom want to see as much of me as they can because who knows when the next time will be? So everyone has been buying me meals, either citing long absence or the poor art student status as the reason for the treats. Whatever it is, thank you very much! I can feel change in the air, not too sure what yet, but change for sure. Both excited and apprehensive about that. But such is life, nothing is certain except for death and taxes, so will just take things as they come. But in the meantime, something else that is certain for now is - more local food to chomp through before I leave!